Named after the pipe organs used during a silent movie. No gold has been found here, but there is a treasure of another sort. 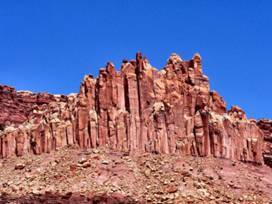 Capital Reef National Park is a well-kept secret. In the minds of many (including the Traveling Morgans) it is more beautiful than Zion National Park. 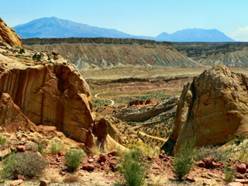 Reefs in Utah are colorful and interesting. When we find an explanation, we will link to it. Driving down these tight switchbacks to the lower road in a long truck with dual rear wheels is an adventure. We had to back up in order to make some of the turns. Not well known, but worth visiting. Not quite a true slot canyon, but very narrow — although you can drive well into it.